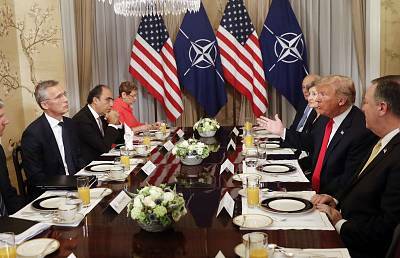 BRUSSELS — President Donald Trump targeted Germany on Wednesday in reiterating his demand that NATO countries step up their defense spending so that they shoulder a greater share of the burden in protecting Europe from Russia. Trump said it is not fair to American taxpayers that Germany buys oil and gas from Russia while enjoying the umbrella of defense provided by U.S. dollars. "Germany is a captive of Russia," he said, pointing out that the country pays "billions and billions of dollars" to a Russia for energy.Trump said that was "inappropriate. "He added: "Germany is a rich country. "Even before the pomp-filled welcoming ceremony of the North Atlantic Treaty Organization meeting here, Trump made clear in a brief exchange with Secretary General Jens Stoltenberg that he has no intention of easing pressure on alliance nations just because Europe is nervous that tensions could empower Russian President Vladimir Putin, with whom Trump is scheduled to meet Monday in Helsinki. Stoltenberg tried to temper what Trump was saying. "We have all been able to unite around our core values, that we are all stronger together than apart," he said.Trump pushed back. "How can you be stronger when a country is getting energy from the person you want to protect against?" the presdient asked. "Because we understand when we stand together we are stronger," Stoltenberg explained.The line of argument is nothing new for Trump: it's been his most consistent criticism of traditional American allies and one that he made both at a campaign rally in Montana last week and in Washington just before he departed fora weeklong trip to Europe. 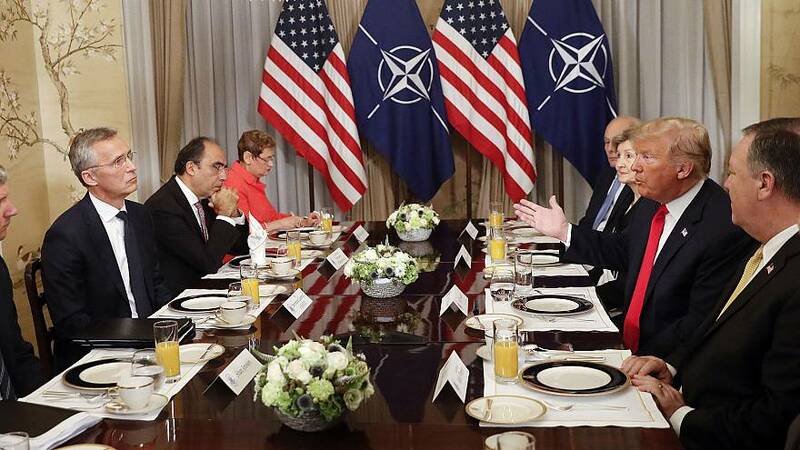 But the message may land a differently — a little more directly — now that he is in Brussels and meeting face-to-face with the leaders of NATO nations.His ambassador to NATO, former Sen. Kay Bailey Hutchison, said last week that the goal of the summit is to project unity. But Trump's demands threaten that outcome.